President Trump and first lady Melania Trump meet with Pope Francis on Wednesday at the Apostolic Palace in Vatican City. President Trump had an audience with Pope Francis at the Vatican's Apostolic Palace on Wednesday, receiving messages about peace, the environment and immigrants from the religious leader. The meeting came a year after the pope suggested that Trump "is not Christian" because of his plan for a U.S-Mexico border wall. Their encounter was smooth and brief, lasting about 30 minutes. The two leaders smiled as they posed for photos, and Trump introduced first lady Melania Trump, along with his daughter Ivanka and her husband, Jared Kushner. "At the end of the audience, the pope gave Trump copies of his writings," NPR's Sylvia Poggioli reports from Rome, "including his encyclical on climate change — a topic on which Trump has a very different opinion." The pair exchanged several gifts: Trump gave Francis books by Martin Luther King Jr., and the pope also gave Trump an emblem of an olive tree, representing the need to pursue peace. "We can use peace," the president replied. As they shook hands in farewell, Trump told the pontiff, "I won't forget what you said," adding that the pope should call on him for help. Later, Trump met with Italian Prime Minister Paolo Gentiloni. When asked about his discussion with Francis, Trump said it had gone very well. "We're liking Italy very, very much, and it was an honor to be with the pope," he added. Trump later tweeted that it had been an "honor of a lifetime" to meet the pope. He added, "I leave the Vatican more determined than ever to pursue PEACE in our world." Francis had criticized then-candidate Trump in February 2016, after Trump unveiled a key goal of his presidential campaign: walling off the U.S. border with Mexico. "I'd just say that this man is not Christian if he said it in this way," the pope told reporters after visiting Mexico. "A person who thinks only about building walls, wherever they may be, and not building bridges, is not Christian." In response, Trump said, "For a religious leader to question a person's faith is disgraceful." Before the spat, Trump had mostly praised Francis, congratulating Catholics on the choice of the new pope in 2013 and saying via Twitter, "People that know him love him!" 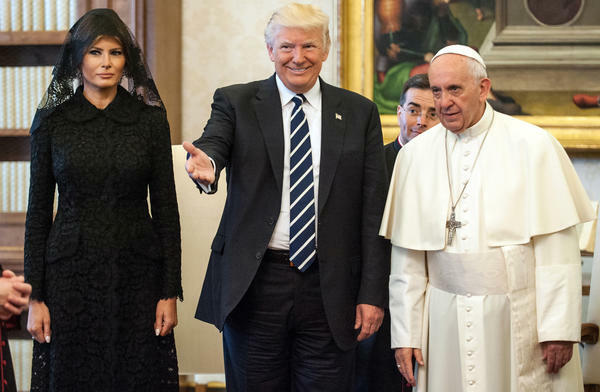 Wednesday's meeting also included an exchange between Francis and the first lady, who wore a veil in accordance with Vatican tradition. They shook hands and the pontiff asked her what she feeds the president. "Pizza?" the first lady was heard answering, seeming to try to clarify what the pope had just said. They shared a laugh as Trump smiled. The encounter between the pope and first lady created what's being described as a "lost in translation" scenario: public media in Slovenia (where Melania Trump is from) report that the pope was asking about potica — a traditional sweet nut roll pastry from Eastern Europe. To our ears, it sounds like the first lady said either "pizza" or "potica" back to the pope — who seems to get a kick out of her answer. You can decide for yourself by watching the clip. Slovenia's RTV reports that a Vatican source says Francis is a fan of potica, and that he jumps at the chance to discuss it.